When I was a little child I always dreamed of owning a little red convertible sportscar. I finally got my driving license when I turned 16 years old, the same year my car was born. I worked hard at summer jobs as a student, saving every penny. At 18 years old, I found the car I had been searching for in the Autotrader magazine (no internet then). I found my dream car, a used white convertible Triumph Spitfire 1500. I purchased it from a girl in Kitchener, Ontario Canada. I drove it for a few years then I went off to Agricultural College and the University of Guelph with the hopes of becoming a Veterinarian. My car sat in my parents' backyard while I was in school. When I returned home from school my car needed some mechanical work so off I went to find a job. Then one day I met my husband Kevin and he fell in love with my car as I did. He had some mechanical knowledge and plenty of mechanical friends, something I did not. He had the Triumph Spitfire totally redone mechanically and painted the car the color I adored, a cherry apple red. The car ran better than when I purchased it. His dream was to get married in that car and that is exactly what we did on July 3, 1993. However, there was a little problem on the way to the wedding. All the guests and myself were anxiously waiting for my red sportscar to arrive in Guelph, Ontario from Toronto, Ontario (1 hour drive) for the wedding pictures. One of Kevin's friend was driving the car. Unfortunately, he was late because he forgot to fill the car up with gas before he left since he was excited to finally drive my car. My family wanted to start the wedding pictures without the Triumph Spitfire but Kevin insisted since he refinished the car for me as a wedding present. So everyone waited and finally my red convertible sportscar arrived with cheers from the guests. My Triumph Spitfire was a big part of the wedding and is one of my favorite wedding photos. After the wedding, we took the car on our honeymoon up north to Blind River, Ontario. During the trip, I fell asleep in the car with the top down and we both arrived with massive sunburns. But it was so nice driving in the convertible with the roof down. Throughout the years, I had numerous offers from several passerbys to sell my car to them but I could never do it. 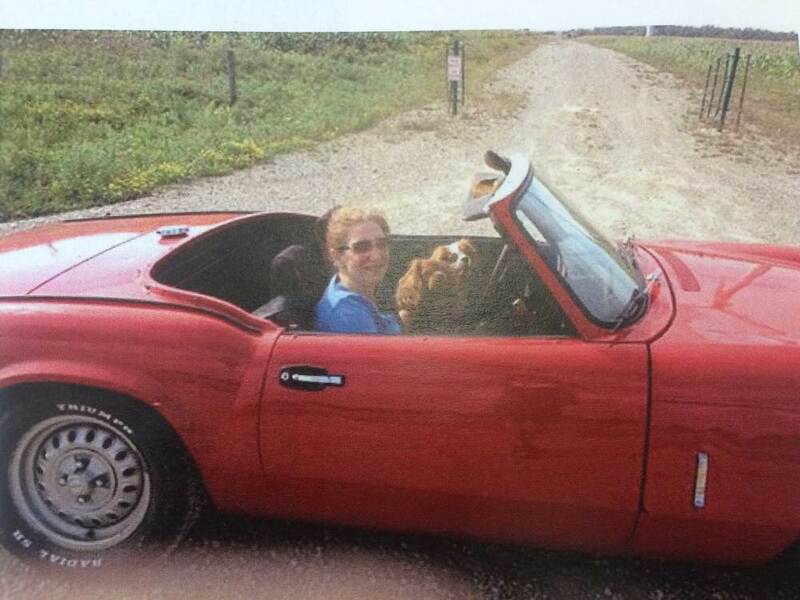 My Triumph Spitfire 1500 is a part of me and my family. My 3 children and my dogs, Cavalier King Spaniels and American Eskimos also love to ride in my car. My children now all are new drivers and someday I will pass the car down to them. But for now, I still have many years to come and my retirement to enjoy driving my Triumph Spitfire. We built a garage for my Triumph Spitfire which is shared by Kevin's old car, a 1977 Firebird (totally unfinished) and my horse stall for my Thoroughbred mare and a Shetland pony. Last year, I purchased a new convertible top from Victoria British Ltd. I was happy to find a supplier who could be there for me to keep my Triumph Spitfire in excellent working order. I would like to continue purchasing parts from Victoria British Ltd. for my Triumph Spitfire so my car lasts forever. My Triumph Spitfire is now a historic car which I have owned for 34 years. My car is very special to me and my family. I would like Victoria British Ltd. to be a part of maintaining my special little car.